This is the long awaited 550 big pump conversion kit. This allows you to bolt in a kawasaki 750 pump into a 440-550 hull. There are 2 choices of rideplate, flat or grooved. 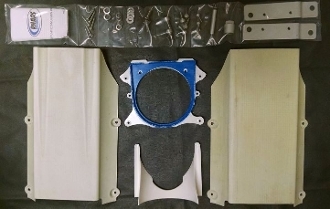 There is an option for an aluminum bulkhead piece. The 550SX hull will not need a conversion bearing, all JS300, JS440 and JS550 models will need the conversion bearing. Lead time on delivery will be about 2-4 weeks. This is for pump conversion only. No engine conversion is shipped with this item. 550sx models you may need to make clearance for stock bilge line as the bilge line in the 550sx is much bigger than the JS550. If using our 701 conversion, you will need a different engine coupler. Please choose the yamaha engine coupler option.